252 pages | 15 B/W Illus. Discourses of Brexit provides a kaleidoscope of insights into how discourse influenced the outcome of the EU referendum and what discourses have sprung up as a result of it. Working with a wide variety of data, from political speeches to Twitter, and a wide range of methods, Discourses of Brexit presents the most thorough examination of the discourses around the British EU referendum and related events. 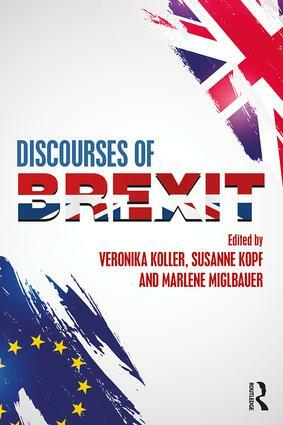 It provides a comprehensive understanding of the discursive treatment of Brexit, while also providing detailed investigations of how Brexit has been negotiated in different contexts. Discourses of Brexit is key reading for all students and researchers in language and politics, discourse analysis and related areas, as well as anyone interested in developing their understanding of the referendum. Veronika Koller is Reader in Discourse Studies at Lancaster University, UK. Susanne Kopf is a Research and Teaching Assistant at WU Vienna University of Economics and Business, Austria. Marlene Miglbauer is Senior Lecturer in English Language, Linguistics and E-Learning at the University of Teacher Education Burgenland, Austria.